Give Kids The World Village is a HUGE blessing to kids all throughout the world! 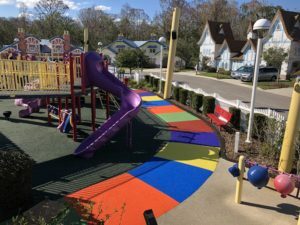 Their facility is an 84-acre, nonprofit resort located in Kissimmee, Florida that provides week-long, cost free vacations to children with life threatening illnesses and their families. Give Kids The World Village contains 168 villa accommodations, as well as magical, whimsical park attractions and entertainment for young children. They have welcomed more than 154,000 families from all 50 states and 76 counties since 1986! 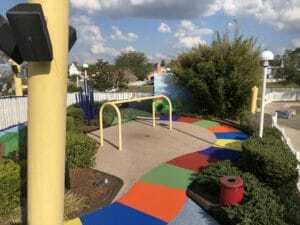 They contacted No Fault for a “custom design” for the pathway areas to-and-around their playground at Fairy Tale Lane. 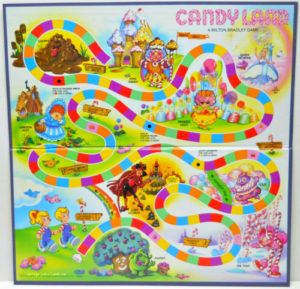 They wanted the pathways to look like the game board of the popular children’s game called “Candy Land”. No Fault installed over 3,000 square feet of No Fault Safety Surface (poured-in-place rubber) for this project, and as you can see, the results are fabulous! 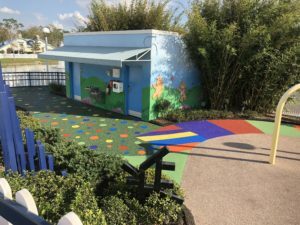 Mr. Michael Bausman, Director of Facilities Resources with Give Kids The World, had the following to say about No Fault and our work, “We absolutely love the new surface! The colors are so bright and vibrant, and are certain to add to the enjoyment of our families for years to come. 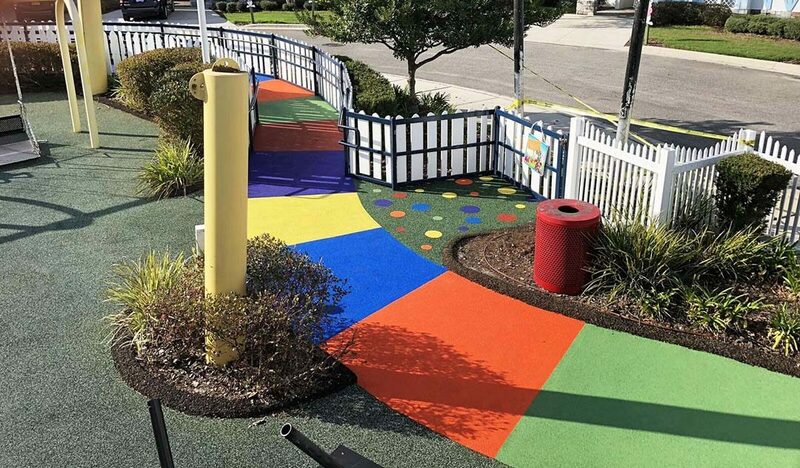 Our No Fault Safety Surface comes in an array of beautiful colors and can accommodate inlaid designs to create a theme that will delight children of all ages. Please contact No Fault Sport Group today at 1-800-232-7766 so we can assist you with your next playground project!